John Wooden, the greatest basketball coach ever, never talked to his teams about winning. He talked to them about preparation and about the process of becoming a great team. What’s all this have to do with SEO and online marketing? Well, the best SEOs don’t talk to their clients about rankings; they talk about the process of making great web sites that earn traffic and convert visitors into customers. They talk about the process of creating great content that attracts links like bees to honey. I would never compare myself to John Wooden, but I do like teaching others about online marketing. So, with that in mind, and inspired by the great coach, here is the…. Please feel free to write about this SEO Success Pyramid and/or link to this post, but please don’t offer the print version for download from your site/blog. Thank you! Commitment: Every successful project I’ve ever worked on has involved a client whose team is enthusiastic and engaged. Whether you’re big or small, one uninterested department or person can sabotage everything. Product/Service: Although you can fool some people into buying crap for a while, real long-term success involves a product or service that people want or need. There’s no substitute for quality. Education/Information: You’re a business owner; you don’t need to become an SEO expert. But you’ll succeed faster if you have access to great information. And as fast as the search marketing industry changes, ongoing access to intelligent information is critical. Patience: True, there are exceptions every now and then, but for the vast majority of companies big or small, search marketing is a process that takes time to implement correctly. There are no short cuts, no quick fixes. Success almost always takes many months, if not a year or more. Design & Usability: Yes, there are some ugly sites that make lots of money; but there are more that don’t. Your best bet is to have a web site that’s attractive and easy to use. Get out of your customers’ way and let them do what they came to your site to do. Keyword Research: If you target the wrong keywords, you’re doomed to fail. You’ve heard that a million times, I hope. More than that, you also need to know what to do with your keywords. Analytics: How will you know you’re successful if you have no way of measuring what you’ve done? Measure, analyze, adjust strategies and tactics as needed. Tools: Having access to appropriate SEO tools can give you an advantage over the competition. Of course, more important than the tools is knowing how to interpret the data they provide. Links: Your great content isn’t going to rank well without links, preferably from relevant, quality sites. I brain-dumped (almost) everything I know about links early last year. Social/Local Findability: Let me explain this since I might be inventing a new term. Social Media Marketing and Local Search are musts. The size and scope of your company may dictate which you emphasize more, but neither should be ignored. Local SEO is a must for most small businesses, but social media can work, too. Bigger companies that target an audience more than a location will find social media offers a lot of opportunities. In either case, the goal is findability. You want customers to be able to find you as easily as possible, and you can do this on social media sites that make local networking easier. Reputation Management: It’s imperative to know what people are saying about your company. This isn’t just for Big Business, either: An old client of mine runs the only roller skating rink in our area, yet is probably losing business because they have a couple negative reviews on a certain Local Search site. Given the growing influence of user reviews, knowing how to manage your reputation is a must. Trust: In my first post of 2007, I said trust is the No. 1 factor, and nothing has changed since then. Trusted domains are powerful domains. When you have trust, from users and search engines, you’re on the way to search marketing success. Don’t miss this more recent article: Why Trust Matters & How To Earn It. As you climb the pyramid, you’ll find buzz/word-of-mouth marketing or maybe community helping you along. To a large degree, these are two sides of the same coin. It’s the people factor, the human element that often separates the winners and losers in search marketing. Get people talking positively about you, whether it be one-to-one conversation among friends or in the larger setting of an online community, and you’ll climb the pyramid that much faster. Awesome. Truly boils everything down to essentials, and I love the fact that you talk about the five “bottom” components. So many businesses expect to start on the next level up. My only gripe is that the title narrows the focus too much. I think this model applies to so many things BEYOND SEO. If you’ve built up a lot of links in topical communities and gained trust among users and customers, you’ve built a business model that can succeed independently of Search Engines. Matt, this is really awesome. I printed out the diagram and have it on my wall. Great stuff. Best. Matt. McGee. Post. Ever. I thought that putting the SEO label on this might not be the best idea, but decided to do it because I’ve been saying for some time now that we need to expand our definition of what SEO is. I know when I “do SEO’ with clients, only a portion of the effort deals with traditional, on-page stuff. 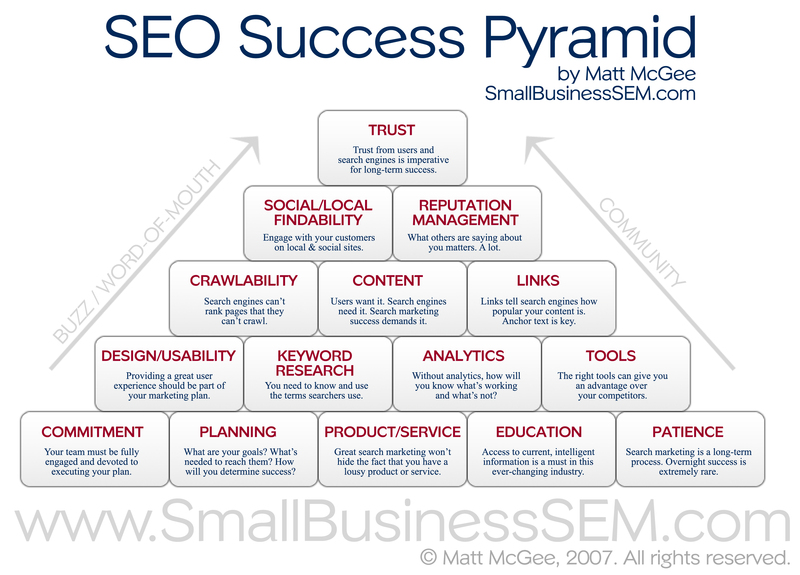 To me, what’s in the pyramid is what I consider SEO to be in 2008. In any case, thank you all for the great feedback. It’s always cool to see your time and effort appreciated! Thanks Matt – I was in the middle of drafting an email to a prospective client on how we could help her with her website when your post popped-up in my feed reader. Now I’m going to completely change the email – and the approach I take when dealing with other potential clients. Maybe it is something I’m missing… but I read your seo pyramid and wanted to make contact with you and could not find any way to do so other than to leave a comment. I don’t mind registering… so that’s not an issue… it’s just that the pyramid talks about … usability… findability, etc. and here I am unable to make easy use of the site to find and contact you. When I tried to click and find you I was taken to WebMarketing . com… and under nowhere on the site do I see that you are affiliated with it…. Thanks for the great feedback on this, gang. I’m glad to see that it’s being received so well and filling a need for people. What else can you ask for? I would like to join your mailing list if you have one. Please advise how I can. @Neil — you’ve put a big smile on my face. Thank you! Great, well thought out article. Some “bricks” of the pyramid should be bigger than others (that would only complicate the drawing, wouldn’t it? ), but all in all, we’re all gonna have to touch on one of those points at some point in time. 2. Analytics should be above “Crawability”, “Content”, “Links” since these three helps to generate “Traffic” and once “Traffic” is generated, “Analytics” come into picture. The word “Analytics” mentioned in the bottom second line should be replaced with “competition analysis”. Very impressive! I think that trust is really the critical element and it starts with the offering. To build trust, we need to get into the mind of our visitors and create moments of magic for them, all along the pyramid. Matt, excellent post. It is nice to see it broken down into Laymans terms. You don’t realize how much goes into SEO and SEM until you break it down. Also helps justify some of the cost that can be charged by good, reputable SEOs. Excellent post, nice illustration of the many facets of an effective SEO / Branding campaign. I am not sure Reputation Management fits for all businesses. That being said, John Wooden’s philosophy as a man, not just as a basketball coach, was always about serving others, over delivering and persisting. He took great interest in those around him, cared about what happened to people and looked for the good in others when it would have been far easier to find fault. As far as I know, these qualities still define him. He is as well loved today as he always was, if not more so. I actually got a few pointers and a pat on the back from the great man himself, and as a 12 year old kid and aspiring pro-basketball player, I can assure you it meant A LOT to me. Strangely, it took your article here to make me consciously and suddenly realize how important those same “basketball” lessons are in life and on the web. They were such formative and powerful lessons that I think I inculcated them into my very being without even being consciously aware of it. Anyway, great article Matt! I have Spunn you, Dugg you and I’m going to mention this article in my business blog. Keep up the great work! Finally, (shameless plug to follow), I blog on the Lakers/NBA at my site, for any SEO fanatics and basketball fan(atic)s like myself! Karl et al, thank you again for the generous comments. I’m glad people continue to enjoy and value this post and the SEO Success Pyramid! Wow, now this is a realy nice article. I am new into SEO and this pyramid is just so exciting for me. All of this is realy interesting I´ll read trough it once more when i have a clear head I think. Excellent resource, thankyou. I am wondering if you might be able to break other components of online marketing into similar pyramids to publish, and this model really serves to help build the correct pillars for a successful campaign, and I would imagine we could apply it to SEM as well? That’s actually a really creative pyramid, and pretty accurate. I love the way it summarizes and builds. I might need to use this in a post because it really lays out basic SEO for someone who is new to the field. This is really cool. I’m going to definitely print this out and hand it out around here. This is the holy grail of SEO. Cheers! Matt, I printed this out for all my co-workers. A brilliant piece of work. Excellent resource, its just goes to show how much effort really goes into a well played out SEO strategy! It doesn’t happen over night, for this reason people are more slow to coming around to understanding all the benefits. I have recently just started working on SEO properly and researching and this post indeed has helped me alot and actually winged me to subscribe to your blog! Great content man, also how would i go about grabbing a copy of the pyramid? Thanks for all the nice comments in the last month or so, sorry for not acknowledging earlier. @Donace — right under the image in the post, there’s a link for the hi-res, printable version. Click that and you’ll have a copy of it for printing or offline reference. Thx! “He talked to them about preparation and about the process of becoming a great team.” What a great quote. I really think that a lot of SEOs get lost here, including me from time to time. It is really about building the best website in your category. If you get too caught up in rankings you can end up going about the entire process wrong, and missing some other great accomplishments that you can achieve along the way. Well written post. The reputation management is huge right now, and often overlooked by too many companies. Very nice post. I think Local Search is too often overlooked. I get a ton of calls from my google local listing. Being a fellow SEO myself I think it is great that someone took the time to do this! I’ve always had an this concept in my mind as I “do SEO” for clients, and this really defines it well for those new starters or SEOs who need a push in the right direction. Very nice article. I am feeling bad that the article was written on Jan 08 and I have got my hands on it in sept 08, wish I would have read it earlier. I have bookmarked it for future reference. This hit a nerve for me. This was very up-front. Too many people, do not realize what’s involved in starting an online business. The pyramid is brilliant. It completly puts the ‘SEO process’ into a step by step process. I have not seen something like this before. A very good breakdown that will help people to visually understand a good SEO/SEM/PPC approach. Well done. This pyramid is one of a kind, it is simply awesome. The info it provides very informative and will help me a whole lot. Thanks. Great post for me to end the year with…. The only thing it doesn’t address for me is the iterative process of change over time – things like keyword improvements / optimizations or improvement of quality of product and the follow-on steps that need to be re-visited after that. But from a general SEO pyramid, it’s spot-on, and easy to use. Just gone through your another article, and found another marvel on your site:D, i think i have to read all your articles, whenever i get time. It will really help me to understand SEO better. Pretty awesome Matt, Never thought I would be saying that about a article on marketing with the word Pyramid in it. Excellent way to illustrate the process of A good Business / Client relationship. Hehehe. I know. I almost regret having used the pyramid because of the negative connotations, but it just fits so perfectly…. thx for the kind words. Great post and I love the chart! WOW! Thanks for the image. Gives me something to pin up on my board! Great effort on this SEO Pyramid. Being it’s what I do all day, design and useability really are two very different standards and/or knowledge bases. But making them two pods makes for an ugly pyramid!!! As a newbie in SEO marketing this is really helpful. This is one of the best SEO article I’ve read so far, very informative. Much success..
It’s really nice and thoughtful! Awesome! Thanks for this. Oh, forgot to say that your SEO approaches also cover some SEM aspects…so it is a wide-sense SEO? I understand that those two are sometimes hard to classify but they are TWO things, right? My definition is SEO is “wide-sense”, Eric. It’s not just about tweaking page titles and copywriting. All of these things work together for real success…. In an everchanging world its great to see common sense laid out so clearly. I like this, but I think there’s a clear difference between a brand site and a media site that needs to be mentioned. Brand sites would include anything that is not dependent on ad sales or other impression-generated revenue. A vacation company, plumber’s site, online storefront etc…. these are always going to be sites that do not command a healthy percentage of repeat visitors. Therefore, SEO is absolutely critical. I get a lot of questions from media companies now about SEO-this and SEF-that. But these sites, with their constant content cycle, cannot possibly benefit from a focus on optimization as much as they can benefit from capitalizing on every possible way to get each visitor to return for some reason. Any reason: To comment, to profile, to argue, it doesn’t matter – a bookmark is worth everything while a few search engine spots up or down are less critical. So, again, like the first days of the web, with our newsgroups and boards and webrings, content is king. Now, how to marry a client’s brand site with the truly effective social networking/publishing/user generated content tools. Micronetworks are the next frontier. It’s a good distinction to make, GS, but I’m not sure I fully agree with you. Are you suggesting the NY Times doesn’t need SEO? They do SEO, they do it incredibly well, and even own an SEO company that also serves many other media sites, too. I get what you’re saying about repeat visitors, but you have to get the visitor in the first place … and SEO can do that. Not discounting good SE efforts….I’m looking at the counter punch for a smart brand site. Truly massive traffic comes from content, so how do these static brand sites – which are the core of most SEM company client lists – tap into the pageview wealth of repeat visits? An average visitor on a content rich site will read, comment, view vids, images, get lost, wander back, check his comments…. and on and on, and before you know it, the pv’s-per visitor are 20 or 30 or more. Then they do it again the next day. It can be easier to get great traffic numbers, and the exponential growth that brings, by working just as hard on new stories, fresh blogs, interactive features, true online customer service, than it can be to cast a wider and wider net for SE window shoppers. Many people are getting the idea that Google is the first stop for every visitor, and it’s just not the case. G owns 80-whatever percent of the search market, but not 80% of all traffic. You don’t Google Facebook, or ESPN, or the NY times every day, you go through your favorites. So how do you get your clients to compel each and every user to Add That Bookmark? Give them a reason to come back the next day, or hour, or 10 minutes….It’s just good strategery. Very nice article on the theory/philosophy of SEO strategy/mindset needed to succeed. I lovethe fact that you mentioned “Patience” as an important factor which can take almost a year to index well. Awesome Post. The chart you used to explain things is really great.. Awesome article! Found it while I was looking for SEO tips. The best part is the downloadable image that solidifies the message and inspires us all to apply each building block to our home businesses to dominate the search engines. Thanks for breaking it down in such digestible parts! The idea of pyramid in SEO was perfect! I think that was one of the most complete tutorial of SEO, getting all efforts need to make a good search engine optimization. I´ve already subscribed the feeds! Very nice illustration of basic SEO structure and processes and great “link heavy” list of factors. I ending up following a link over to your “Traits of a Great SEO Client: Commitment” article, which is another great read… Thanks for the good content and sharing your knowledge. I think the module works even better as a funnel flipped up side down to get to the goal Trust. Is this Matt McGee from Grady HS? Nope, not from Grady HS. Sorry, Steven. 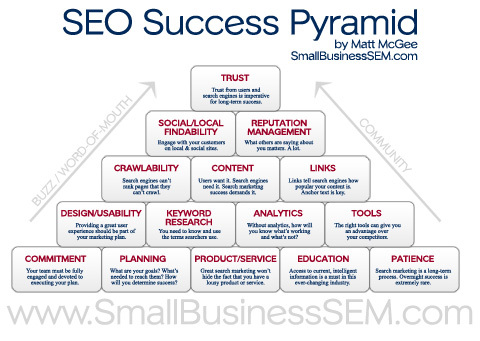 Great SEO success pyramid Matt. This is one of the best diagrams I’ve seen and truly covers all search engine marketing. Thanks. This is a unique chart, I like the concept and agree with it. Very thorough. Matt, Impressive Blog post. thanks ! Thanks for all that you share out here on the web. Great stuff!! I’m a basketball coach and know that if you can get them to focus on prep and becoming a great team then winning will often follow. The temptation is to focus on winning when your not, if you do that then the players focus on themselves and what their teammates are doing wrong and it undoes all the great work… and actually reduces you chances of winning. You’ve taken a golden sporting rule and applied it in a stellar way to the business world! The SEO pyramid is a tool in helping to understand the the importance of SEO. It really helps people who know nothing about SEO learn how important it really is. Anyone who wants to be successful in online marketing should read this. There are countless marketers who fail because they don’t conduct the proper preparation to succeed. Patience is also a necessity. Anyone who thinks they can make thousands in just 1 week is dreaming. This is a very good article. Amazing breakdown Matt, I wish I found this last year. Judging by the number of comments and trackbacks I’m not the only one who will be keeping this printout close by for reference. Your comment below the pyramid especially caught my eye, and in hindsight was a great way to make the post viral. I came across this post from a link on David Mihm’s blog, even though I read your new posts regularly – and I’m glad I did. Nice job, pulling together all the key items and building into methodolgy. Where would you place testing and refinement into your model? Word of mouth is the most underrated/overlooked form of marketing. However, getting to the point and having people talk about your company/service must come first. Still love this post. Did I ever tell you we played darts with it as a joke? Thanks Matt for your article. I’m still new to the SEO concepts and i find this very useful. Thanks once again. I came back to SBSM today after a webinar and it was sure worth the trip. The SEO Pyramid is a great way to show the process. We love helping the small business person, they are the backbone of our world and a key to community. Getting them to understand what needs to be done is a huge learning process for people that are, as a group — “time challenged” at best. Anything you can do to put the words into a picture is a huge help. Wow. At first blush I thought the #1 spot on the serp for “local search marketing” might be a fluke. But after reading this system over, I’d say it’s deserved. Great post! This is the best illustration of why SEO is so much more than just optimizing title tags and metadata. In my opinion Trust is indeed still the no. 1 ranking factor. Also for good rankings google needs to trust your website. Too bad we can’t really measure how much Google trusts our website. Newbie to the field of SM, but big fan of John Wooden. Thanks. This helps me connection alot of dots. Thanks for a concise and invaluable tool, Matt. I work with hundreds of small business owners who generally are intimidated by the process of online marketing. I’ll be sending them to this posting as often as possible as it may do quite a bit to calm their anxiety. SEM shouldn’t be a necessary evil and a wild goose chase and you help articulate that better than I often can. I think of of the major problems with working with companies and websites is the goals are not set early in the engagement. Although in the post you did have a link to Planning an seo campaign and had that as the #1. Without knowing the goals of the customer you constantly have to resell the project because the rankings and traffic take a while to take place. I just gotta say, that diagram is excellent! I think that trust is more important than ever these days, but it was nice to see a diagram of all the other things I need to focus on as well. you can claim it or you can earn it. Following your SEO Success Pyramid, we can earn it! I’d almost place design and usability directly underneath trust. Once somebody does find your site, you have a few seconds to keep them or have them remember you. If you can’t grab them there, all your content is worthless even if it brings in mass amounts of traffic. Just my 2 cents. Your pyramid is still relevant today and I especially agree with Trust as the number 1 factor for SEO success. As long as people want their website to create a relationship with the buyer/visitor, trust is always going to be number 1. I am a programmer, moving towards web design. Am slowly researching all the things I need to know about giving a client a good service. Am bottom feeding atm with clients that dont appreciate SEO AT ALL. I like the content of this page and have favourited it for digestive purposes and for use with my clients. Although it’s been a while since the post was first published, I think the pyramid is still relevant. So many times we get focused on the third level that we might forget about the base. Matt, thanks for the awesome post! Great post… very encouraging to see SEO as a process. Nothing but admiration. The best overview of the SEO Process that I’ve seen so far. It gives me a better appreciation of the entire process and not just the technical aspect of it. Thanks Matt. Wow I wasn’t expecting to come across this, totally happened by accident. I am a site owner myself (1 month old)and I find your pyramid super helpful! I even printed it out to remind me of certain things such as patience. I know it takes time yet I wish it could happen over night! Very refreshing to see your SEO info explained the way you do. Way to many SEO rip artists out there taking advantage of people all the time. Your Pyramid shows everyone that it’s a lot of work and a long term project. When you come down to it at the end of the day it’s all about working with the right people. You have explained this very well. I like this line “one uninterested department or person can sabotage everything.” well said. Thanks for putting up this page! I know this post is not new – but we just started doing our own seo after getting ripped off three times in a row – a “Map” or this pyramid is exactly what I need to have a game plan. Thank You very much. Nice diagram! It’s actually quite interesting to see it broken down this way and it’s funny how some SEO companies get stuck on the rankings and not the process behind writing quality content! The human element and word of mouth advertising online has grown so much with the growth of Twitter & Facebook, I do wonder if Facebook/Twitter will fade off like MySpace did. Great SEO pyramid. It’s a few years old, however it’s still very important and it’s still very valid. Trust is really the critical element for me. To build trust, we need to get into the mind of our visitors and provide as much value as we can for them. Hey Matt! What a great article you have written. I am just starting to look at SEO optimization and your pyramid has shed some light on that area for me. Great post, very interesting read. Having great content and building website’s that meet the end user. The SEO Success Pyramid is good for preperation and define what goals need to be achieved in the SEO stages. Great article Matt, keep up the good work! Awesome Article! Loved the pyramid. I’d say the biggest thing I need to work on are the 2nd and 5th blocks of the pyramid (planning and patience). Creating a plan for how you will gradually optimize your site is so important to stick with. Brilliant article. Too many SEOs get hung up in the nitty gritty and lose sight of the big picture. Thanks Matt! By placing Pyramid in the title I automatically thought some kind of scheme but actually what you are presenting is very interesting and can help with SEO and many other things. To overcome challanges you have to prepare and take it step by step, I really love how you broke the process down to these areas. Thanks! Thanks Matt for sharing such a wonderful seo pyramid. I would request, if you can share a similar article related to pay per click marketing or adwords, and its essential elements. Thanks Ranjan, but sorry to say that I won’t be able to do a PPC version. Paid search is not an area where I do much work. This is a great post that still holds up even though its a few years old. I didn’t realize that at first, but when I saw the comments I noticed the date. Then it got me thinking about how often search engines change, but how consistent the core SEO fundamentals have been. I’ll be bringing a copy of this pyramid to my next meeting. A good weapon against flavor of the month discussions. Thanks Matt! Thank you very much, Chris. Every year or so, I wonder if it’s time to update this pyramid. And so far, I haven’t found anything I’d change. Maybe next year! Fantastic article, really enjoyed reading it and learned a few things. Online reputation management is a huge aspect of business that not many focus on yet, I think it will really come into light as 2012 progresses. Thanks Matt! The SEO pyramid is awesome. I will use this many times! Thank you. I remember when the SEO pyramid came out lol. I used this in one of my first presentations at a company to more so show the process of what we would be doing work wise with their site in order to see improvements in the SERPS. Great pyramid, and with all the new 2012 changes I’ve seen, I’d love to see a new one come out, Who’s on it lol! Thx Brandon. I look back at this every 6-8 months or so, and I can’t think of anything I’d change. Matt, awesome article. First time I’ve seen the SEO pyramid. I’ll be using your post as a reference for this weeks blog entry. I’ve been focusing on “Inbound Marketing” tactics. This really puts the concept of Inbound Marketing into an excellent visual. Wow, I’m amazed that not much has changed 4 years later no matter how many updates Google launches. Great stuff. 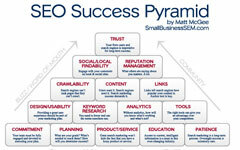 Thanks you Matt, for creating this SEO Success Pyramid. I am going to print it out and stick it on my wall! I love that you used John Wooden in this post. One of the best coaches if not the best basketball coach of all time. Comparing that with SEO is true beauty. Thanks for the article.